2004 Visa Hall of Fans Inductions. 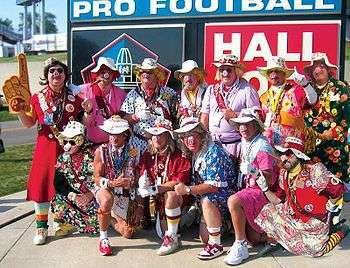 The Hogettes were a group of 12 male Washington Redskins fans who wore women's dresses, garden party hats, and pig snouts for two purposes: to cheer on their favorite NFL team and to raise money for charity. The group was founded in 1983 by Michael Torbert and became a regular fixture at Redskins games for nearly 30 years. When the group announced its retirement, effective with the end of the 2012 season, it had 12 active and 15 former members, including three who have been featured in an exhibit at the Pro Football Hall of Fame as part of the VISA Hall of Fans. The group retains a high profile largely because of their outrageous costumes, but also because of their frequent work for charitable organizations. The Hogettes have appeared in a national advertising campaign for VISA, and they provide support for many charities, including Children's Miracle Network, Ronald McDonald House, and March of Dimes. They have raised over US$100 million for these and other charitable causes. Despite their philanthropic work, the Hogettes are disliked by some and have even been attacked by fans of opposing teams. The origin of the Hogettes can be traced to October 1983 when Michael Torbert (Mikey T.), founder of the group, went to a Halloween party at his grandmother's retirement home wearing one of her old dresses as a costume. The costume was such a hit that he gathered a group of men who he "thought were tough enough to go out in public in a dress." The group would go to children's hospitals to cheer up sick children. 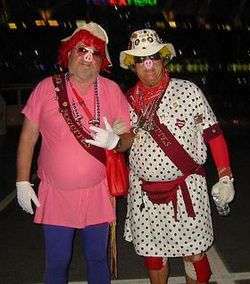 On November 27, 1983, the group attended their first Washington Redskins football game in full drag, but with the addition of pig snout masks, in reference to The Hogs, the nickname of the Redskins offensive line players. "Big Georgette" and "Boss Hog" in front of the Washington Redskins' FedExField. Led by Mikey T., now known as "Boss Hogette", the group became regular fixtures at Redskins home games, both at their old home of RFK Stadium and their new home of FedExField. The group made more than 100 appearances each year for charitable events, and Mikey T. and two other Hogettes were inducted into the Pro Football Hall of Fame as "ultimate" Redskins fans. There were a total of 27 members of the group from 1983 to 2012, with twelve active members at conclusion. Though they have considerable notoriety, they receive no special treatment or official recognition from the Redskins. After the conclusion of the 2012 NFL season, the Hogettes announced they would be retiring their iconic outfits after 30 years of appearances. In the 1980s, the Washington Redskins' Offensive Line coach, Joe Bugel, began to refer to his linemen as "Hogs". The Hogs were credited for much of the Redskins success in the 1980s and early 1990s, including four Super Bowl appearances and three Super Bowl wins in a 10-season period from 1982 to 1991. The group began wearing pig noses and named themselves "The Hogettes" in reference to the Hogs  and to the Washington Redskins' official cheerleaders, originally known as the "Redskinettes." The Hogettes organized and attended charitable events in the Washington, D.C., area for over twenty years. In that time, they helped raise more than US$100 million for various charities, including Children's Miracle Network, Ronald McDonald House, and March of Dimes. Upon reaching this landmark value, Howard "Howiette" Churchill remarked, "That's a lot of money for a bunch of fat old grandpas in pig noses and dresses." Among these events were golf tournaments, including the Hogettes' annual charity golf tournament, walk-a-thons, truck rallies, galas, and other charity benefits. While some of their charitable efforts went toward helping their local community, most of the money they raise goes toward helping children. "Hogette for a Game" was an annual fund raiser. In 1995, Nick "Nickette" Nerangis' wife bought him this package. He subsequently became a substitute Hogette for several years before becoming an official member in 2002. One female fan has, for several years, served as "Hogette for a Game" through winning annual auctions. In 2000, she raised more than $11,000 for children's charities in order to attend one game with the Hogettes that season. In an online interview with fans, Torbert stated "You... have to have a sense of humor for many things from day to day. It is tough to be humorous when the [Redskins] lose, but it's even tougher to face a sick child in a hospital room, and cheer them up with our humorous looks. That's tough." In addition to gaining national exposure through their outrageous costumes and continuous work with charitable organizations, the Hogettes were guests on The Tonight Show with Jay Leno, and were featured in a VISA television commercial. Despite their generous philanthropy and positive attitude in the stands, not everyone appreciated the Hogettes. Longtime Washington Redskins owner Jack Kent Cooke and Daniel Snyder—the current owner—both failed to embrace the Hogettes. The group was called "incredibly obnoxious" and "annoying", and were attacked in the infamous 700 Level at Veterans Stadium in Philadelphia by angry Philadelphia Eagles fans. In addition to the 12 final season members, there were 15 retired "official" Hogettes, as well as numerous temporary and substitute members, including winners of the "Hogette for a Game" auction. Boss Hogette Michael Torbert Founder Named the 1998 "Ultimate" Redskins Fan in the VISA Hall of Fans at the Pro Football Hall of Fame. Grandpa Hogette Ralph Campbell Original member from 1983 The first Hogette to join, wore a yellow dress, and was once referred to in an Associated Press story as "the pretty one." BIG MACette Michael McCartney Original member from 1983 Dresses as Santa Hog for the Redskin's Christmas game at FedExField. Joevette Joe Varnadore Original member from 1983 Oldest of all the Hogettes, and has worn the same lavender dress for over 20 years. Big Georgette George Maxfield Original member from 1983 Has worn the same pink dress from the beginning. Edette Edward J. Heid, III Joined in 1983 Although not one of the "original", he joined within the first month. Howiette Howard Churchill Joined in 1992 Named the 2004 "Ultimate" Redskins Fan in the VISA Hall of Fans at the Pro Football Hall of Fame. Spiggy David Spigler Joined in the mid-1990s Runs the annual Hogette benefit golf tournament. Hog Ed Eddie Souder Joined in 2001 Hogette "Rookie of the Year 2001". Nickette Nick Nerangis Hogette-for-a-Game in 1995, recruited as a member in 2002 Hogette "Rookie of the Year 2002". Hollywood HillBilly Mike Gardner One of the newer Hogettes Named the 2003 "Ultimate" Redskins Fan in the VISA Hall of Fans at the Pro Football Hall of Fame. On January 11, 2013, founder Michael Tolbert announced that the Hogettes were retiring after 30 years, telling the Washington Post, "30 seasons is enough of guys in pig snouts and dresses." Tolbert further states, “It’s a new era. It was great seeing RGIII and Alfred Morris break onto the scene, and it’s a perfect time to retire the old era and start the new.” The Hogettes insist that they will continue to be fans of the Redskins and do charity work in the Washington area. 1 2 3 4 5 6 Levey, Bob (January 4, 2000). "Q&A With Bob Levey: Michael Torbert, Boss Hogette". Washington Post Online. Retrieved on October 10, 2007. 1 2 "Our Founding History". Hogettes.org. Retrieved on October 10, 2007. ↑ "VISA "Hall of Fans" Winners". pfufa.org. Retrieved on October 10, 2007. ↑ Mikey' T.'s full costume in the VISA "Hall of Fans". Flickr. Retrieved on October 10, 2007. ↑ "Redskins Fans "Hogettes" Retiring". ESPN. Retrieved 11 January 2013. ↑ McKinzie, John (December 29, 2005). "Topic:Washington Redskins - Subject:Mascot". en.allexperts.co. Retrieved on October 10, 2007. ↑ Farhi, Paul (January 14, 2006). "The Redskins' Media Offensive". The Washington Post, p. C01. Retrieved on October 10, 2007. 1 2 Manners, Tim (ed.) (Nov/Dec 2006). "Ultimate Fans" (PDF). The Hub Magazine, p. 9. Retrieved on October 10, 2007. 1 2 Solway, Mark (September 23, 2004). "Cheap Seats: The Hogettes". TheHogs.net. Retrieved on October 10, 2007. ↑ Hogettes' Past Events. Hogettes.org. Retrieved on October 11, 2007. ↑ Benton, Nicholas F. (October 6–12, 2005). "1st 'Taste of Falls Church' Harbinger of City's Future". Fall Church News-Press Online XV (31). Retrieved on October 10, 2007. ↑ "Charities We Support". Hogettes.org. Retrieved on October 10, 2007. 1 2 3 Yost, Mark (August 8, 2006). "Football's Ultimate Fanatics on Parade". Wall Street Journal, p. D5. Reprinted in usna63.org. Retrieved on October 11, 2007. ↑ (Original Airdate: Friday, December 28, 2001). "The Tonight Show With Jay Leno Episode description". Couchville.com. Retrieved on October 11, 2007. ↑ The Hogettes VISA commercial (Video). AdvertisementAve.com. Retrieved on October 11, 2007. ↑ Hickey, David (January 9, 2004). "No Ordinary Joe". National Review Online. Retrieved on October 12, 2007. ↑ Loverro, Thom (December 12, 2002). "Good Riddance". The Washington Times. Reprinted in NestOfDeath.com. Retrieved on October 12, 2007. ↑ "Boss Hogette biography". Hogettes.org. Retrieved on October 11, 2007. ↑ Steinberg, Dan (September 1, 2010). "Goodbye to GrandPa Hogette". Washington Post, D.C. Sports Bog. Retrieved on May 25, 2011. ↑ "BIG MACette biography". Hogettes.org. Retrieved on October 11, 2007. ↑ "Joevette biography". Hogettes.org. Retrieved on October 11, 2007. ↑ "Big Georgette biography". Hogettes.org. Retrieved on October 11, 2007. ↑ "Edette biography". Hogettes.org. Retrieved on October 11, 2007. ↑ "Porkchop biography". Hogettes.org. Retrieved on October 11, 2007. ↑ "Stoneyette biography". Hogettes.org. Retrieved on October 11, 2007. ↑ "Howiette biography". Hogettes.org. Retrieved on October 11, 2007. ↑ "Spiggy biography". Hogettes.org. Retrieved on October 11, 2007. ↑ "Hog Ed biography". Hogettes.org. Retrieved on October 11, 2007. ↑ "Nickette biography". Hogettes.org. Retrieved on October 11, 2007. ↑ "Hollywood HillBilly biography". Hogettes.org. Retrieved on October 11, 2007. ↑ "Redskins fans "Hogettes" retiring". ESPN.com. Retrieved 11 January 2013. Wikimedia Commons has media related to Hogettes.